The photo gallery links open in separate windows. Because photos can be such bandwidth hogs, we’re hoping this will be ease the load time on dialup connections. Enjoy! 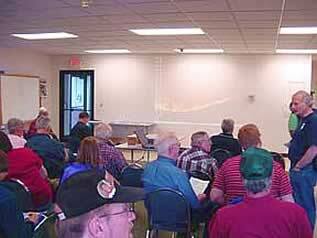 April 25, '05—We had a great turnout for the NWS-sponsored Skywarn training! Thanks to all who participated and especially to the NWS-Burlington staff who provided the it. For more information on NWS-Burlington & Skywarn, visit www.weather.gov/burlington.